Ten alumni were honored with the prestigious Emerson Excellence in Teaching award, earlier this month. Now in its 29th year, the award pays tribute to area educators - from kindergarten teachers to college professors - for their achievements and dedication to the field of education. 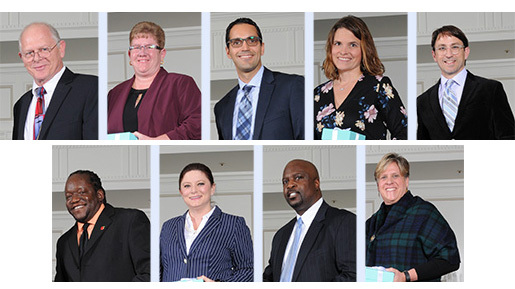 The 2018 recipients were selected by their schools’ administration to honor their accomplishments and steadfast dedication to the teaching profession. The ceremony and reception was held at the Ritz Carlton on Sunday, Nov. 11, 2018, and each honoree received a Tiffany & Co. crystal apple box to commemorate their achievements. Below are the Webster alumni who received the award, with their graduation year and where they currently teach. Award recipients will have the opportunity to apply for a Gold Star Grant from Emerson that will be presented in spring 2019. Honorees from this year and the past five years are eligible to apply for the competitive grants, which are designed to fund educational projects that reflect the pillars of the Emerson brand – technology, innovation and leadership. Since 2006, Emerson has awarded $615,000 to area teachers and schools through the Gold Star Grant program. Emerson, a global technology and engineering leader headquartered in St. Louis, founded the Excellence in Teaching Awards program in 1989. Under its Charitable Trust, the company donated $8 million to many education programs, individual schools and scholarship recipients nationally for the year ending September 30, 2018.